The One Touch Can Opener is the fast and easy way to open cans. 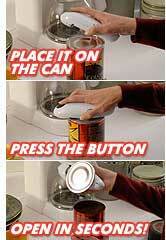 Just place the One Touch on top of the can, press the button and the can will be open in seconds. When cutting is complete just lift the One Touch off the can and the magnet will conveniently pick up the lid for you. It’s that easy!